Police in Thailand have arrested a university student who is said to have admitted hacking into the Prime Minister's Twitter account and posting messages accusing her of incompetence. 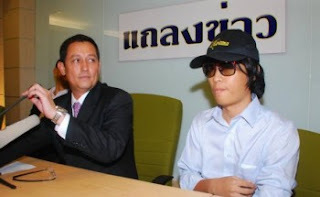 22-year-old Aekawit Thongdeeworakul, a fourth year architecture student at Chulalongkorn University, could face up to two years in prison if found guilty of illegally accessing computer systems without authorisation. Thailand's Prime Minister, Yingluck Shinawatra, had her Twitter account hacked last weekend - and her followers saw a stream of messages criticising her leadership. "If she can't even protect her own Twitter account, how can she protect the country?" In bizarre scenes, Thongdeeworakul appeared before reporters at a hastily convened news conference in Bangkok, alongside ICT Minister Anudith Nakornthap. The minister told members of the press that the alleged hacker believed his actions were innocent "as he didn't realise it would be a big deal." According to the ICT minister, Thai Prime Minister Yingluck Shinawatra had her Gmail account hacked on September 30th by unknown people, and her password was disseminated across the computer underground.